Yesterday was a perfectly beautiful spring day, the first we’ve had here in DC thus far. 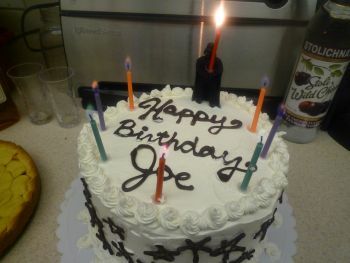 How appropriate that the warm weather decided to show up on Joe’s birthday! 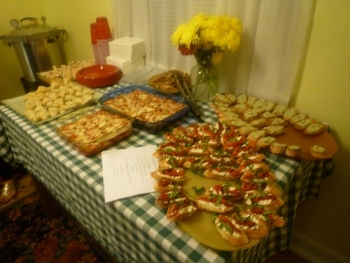 We had some friends over for a celebration and spent the evening enjoying wonderful company and (if I don’t say so myself) some pretty tasty food. *Okay, here’s the thing. The recipes I referenced for this all called for red pearl onions. I can’t find them anywhere. I don’t know why. So, I cheated and dyed them red with some of the liquid from my home-canned beets. It added bonus flavor and made them an awesome color. Put all of the ingredients into a pot and add water just to cover the onions. Bring the mixture to a boil and then reduce to a simmer, swirling the pan every so often to keep the onions from scorching. Reduce until there is about ¼ cup of syrupy liquid left in the pan. Remove the onions with a slotted spoon and reserve syrup. Heat the milk, stirring frequently to keep from scorching. When it reaches 185 degrees, add the vinegar in 3 separate additions, stirring between each one. Remove the pot from the heat and let it sit for five minutes, then stir for another five or until the curds have firmed up a little bit. 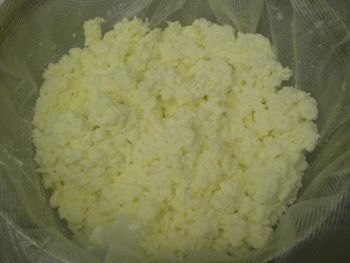 Strain into a colander lined with cheesecloth and then hang the curds to drain for an hour. You can salt to taste and use this as is, but I really wanted it to be firm so that I could cut it into cubes. 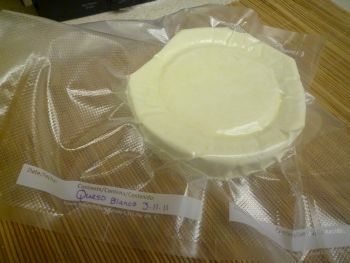 So, if you have a cheese press, line a mold with cheesecloth and press the curds at 10 lbs. for 10 minutes, redress the cheese and then press at 25 lbs. for 3 hours. Put it all together: Thread one onion and one cube of queso blanco onto a skewer and drizzle with the reserved syrup. 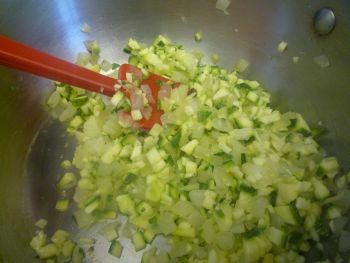 In a wide pan, sweat the diced onions in olive oil until soft, translucent and sweet. Add the garlic and cook for another minute. 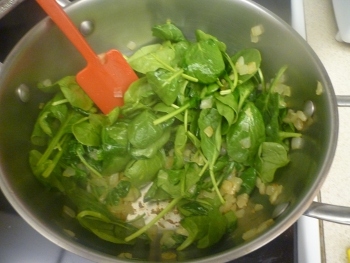 Add the spinach and cook just until it has wilted. Set the pan aside. 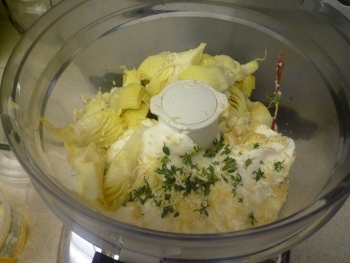 In the bowl of a food processor, combine the yogurt, cheese, sour cream, artichoke hearts, thyme, mustard, pepper, and a few pinches of salt. Pulse to combine. 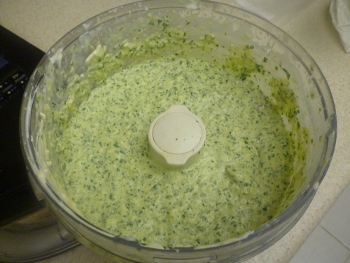 Add the spinach, onion and garlic to the food processor and pulse until it has a spreadable consistency. Top each toasted baguette slice with the spread and serve at room temperature. To make the fromage blanc, heat 1 gallon of milk to 85 degrees and add a packet of fromage blanc starter. Stir vigorously for a minute or two and then cover the pot and allow the milk to ripen at room temperature for 12 hours. Scoop the curds into a colander lined with cheesecloth, and then hang them to drain for 6 hours. It should have the consistency of cream cheese. Salt to taste. 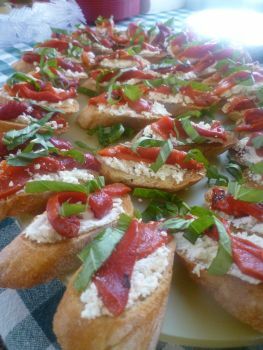 Top each toasted baguette slice with a layer of fromage blanc, diced roasted red peppers, and chiffonade basil. I am sorry that I didn’t get more pictures of this process, but my hands were covered with butter most of the time and photography got the shaft. These are so good and you can make them in advance, freeze, and then bake as needed. Handy. Preheat the oven to 400°F and line baking sheet with parchment paper. Cook the onion in the butter until translucent and then add the mushrooms and nutmeg. Saute for 5 to 7 minutes, until liquid has been released and has partially evaporated. Add the sherry and evaporate the alcohol by cooking over low heat for 2 to 3 minutes. 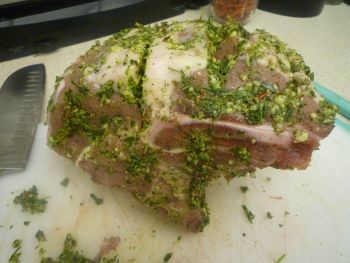 Stir in the flour, herbs, and some salt and pepper, and let cool. The mixture will be moist. 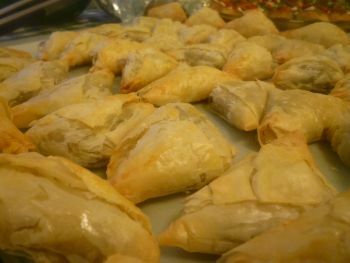 Take one sheet of phyllo at a time from their package; cover the remaining sheets with plastic and then a damp towel to keep them from drying out. Brush one half of the sheet lengthwise with butter. Fold the unbuttered side over the buttered side, carefully, smoothing out as best you can. Again, brush one half of this lengthwise with butter, and fold the unbuttered side over it again. You’ll end up with one long column. Place spoonful of the mushroom filling near the end and sprinkle a teaspoon of parmesan over it. Begin folding one bottom corner of the phyllo strip over the filling until it meets the opposite edge, forming a triangle, as if you were folding a flag. 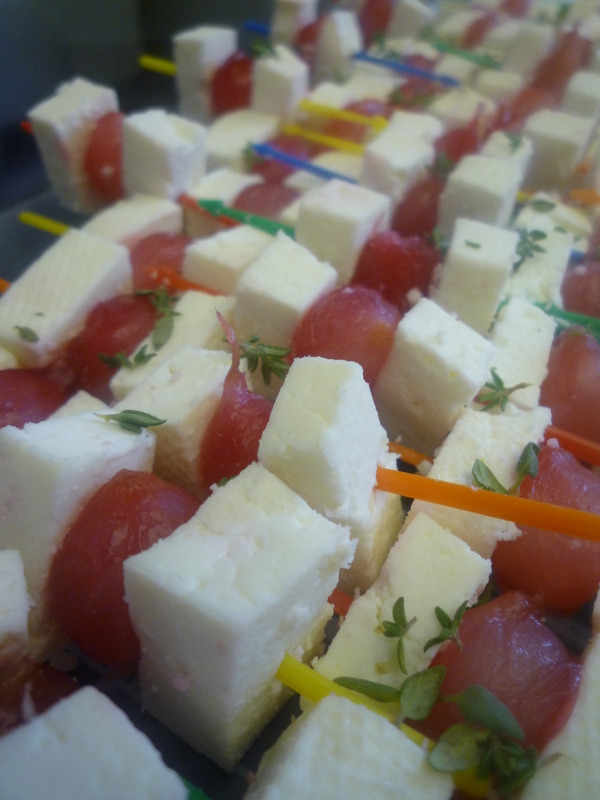 Place the triangle seam side down on the baking sheet, brush lightly with egg wash and sprinkle with parmesan. Bake for 15 minutes and serve warm or at room temperature. Normally, this is seared and roasted, but oven-space was at a premium and so I went the crock pot route. 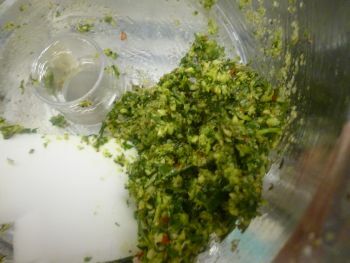 Combine all of the ingredients for the rub in a food processor and pulse until they form a paste. 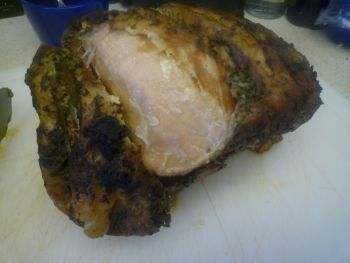 Cut several inch-deep slits in the roast and stuff some of the rub inside of them. Slather the roast with the remaining rub. At this point, I vacuum sealed mine to let it marinate for a few days. 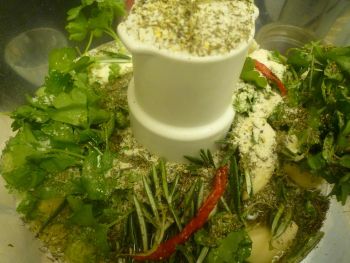 Add the broth to the pan to deglaze (scrape the bottom to get all of the bits of herby piggy goodness) and bring the mixture to a boil. Simmer for 5 minutes and then pour the liquid onto the roast in the crock pot. Cook on high for 5-6 hours or on low for 7-8 hours. The roast ended up so tender that I shredded it and served it with the reduced cooking liquid. I made the ricotta and mozzarella for these and you can find photo tutorials for them here. 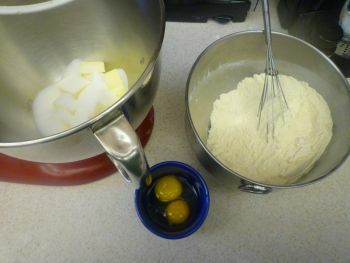 To make the pasta dough, beat together the eggs, oil and water and then stir them into the flour. Get your hand in the bowl and begin to knead the dough together.Knead until it is smooth and then flatten into a disc, wrap in plastic wrap and rest at room temperature for 30 min. 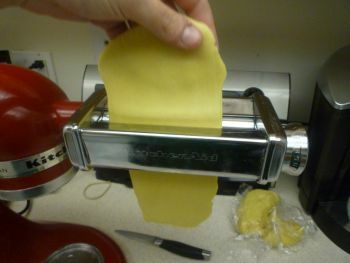 Roll the pasta into sheets, and then cut into 5 in. squares. Boil the squares in salted water for 1-2 minutes. Drain and leave these to rest on damp towels. Combine all of the ingredients for the filling and taste for seasoning. 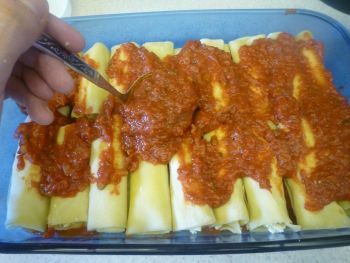 Spoon a row of filling along one end of a pasta square and then carefully roll up into a tube shape. Place this, seam side down on a baking sheet while you prepare the others. If you are freezing them as I did, freeze them individually on a baking sheet before moving to a bag. To make the sauce, sweat the onion in a few tablespoons of olive oil until translucent. Add the zucchini and garlic and sauté until everything is soft and fragrant. 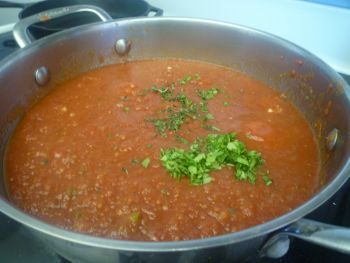 Add the tomatoes, peppers and spices and simmer for a few hours or until the consistency is to your liking. Add seasonings as needed. Preheat the oven to 350 degrees. Spoon a thin layer of sauce onto the bottom of a 9×13 in. baking dish. 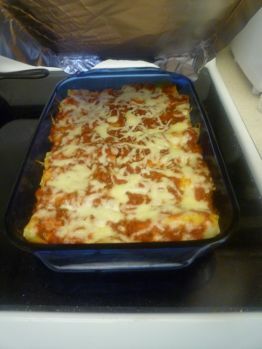 Arrange the manicotti in rows and then top with the remaining sauce (and some extra cheese if you like). Bake for 40 minutes or until cooked through. Cover with foil and rest for at least 15 minutes before serving. I like this because you can make the dough, throw it in a bucket in the fridge and forget about it for several days before baking. In a large plastic resealable container, mix yeast and salt into 3 cups lukewarm water. 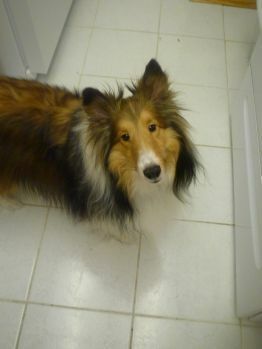 Using a large spoon, stir in flour, mixing until mixture is uniformly moist with no dry patches. Do not knead. Dough will be wet and loose enough to conform to shape of plastic container. Cover, but not with an airtight lid. Place a broiler pan on bottom rack of oven. Place baking pan on middle rack and preheat oven to 450 degrees. Sprinkle a little flour on dough and on your hands. Pull dough up and, using a serrated knife, cut off a grapefruit-size piece (about 1 pound). 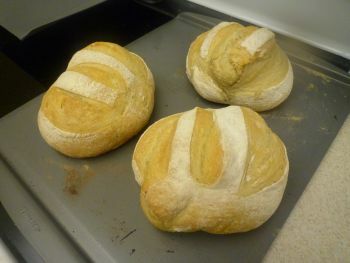 Working for 30 to 60 seconds (and adding flour as needed to prevent dough from sticking to hands; most dusting flour will fall off, it’s not intended to be incorporated into dough), turn dough in hands, gently stretching surface of dough, rotating ball a quarter-turn as you go, creating a rounded top and a bunched bottom. 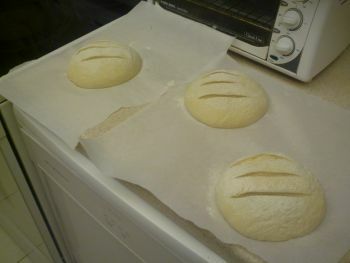 Place shaped dough on a piece of parchment and let rest, uncovered, for 40 minutes. Dust dough with flour. 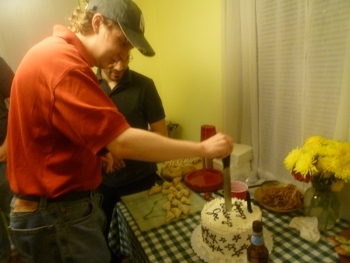 Using a serrated knife, slash top of dough in three parallel, 1/4-inch deep cuts. Slide dough onto preheated baking sheet. Pour 1 cup hot tap water into broiler pan and quickly close oven door to trap steam. Bake until crust is well-browned and firm to the touch, about 30 minutes. Remove from oven to a wire rack and cool completely. 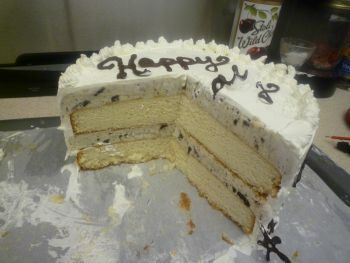 The guest of honor requested an ice cream cake with vanilla cake layers and Oreo ice cream. Two layers of vanilla cake, cooled completely, wrapped in plastic wrap and frozen. I used this recipe. To make the ice cream layers, line two 9 in. pans with plastic wrap and scoop softened ice cream into each. Flatten out the ice cream by pressing another pan on top of it. 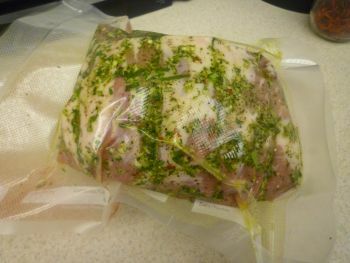 Cover with plastic wrap and place in the freezer to harden. Stack the layers as such (from bottom to top): Cake, ice cream, cake, ice cream. Again, cover this in plastic wrap tightly and freeze. Before icing your cake, trim the sides as needed to make them even and neat. Frost the cake with whipped cream and return to the freezer. I decorated this one by piping tempered chocolate designs onto wax paper, letting them cool, and then applying them to the cake. 9 tablespoons unsalted butter, room temp. Whisk together the flour, cornmeal, baking powder and salt. 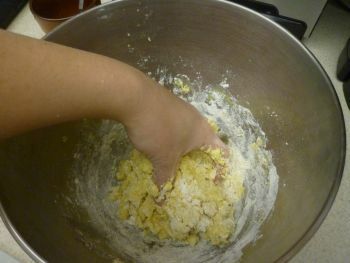 In a stand mixer, mix the butter and 1/2 cup sugar together until smooth. Add the egg, egg yolk, and vanilla bean paste and beat until combined. Gradually add the flour mixture and mix until the dough just comes together. Transfer about one-third of the dough to a lightly floured counter and shape it into a log about 2 in. diameter. Wrap it in plastic wrap freeze for an hour. Transfer the remaining dough to a buttered 9-inch spring form pan. 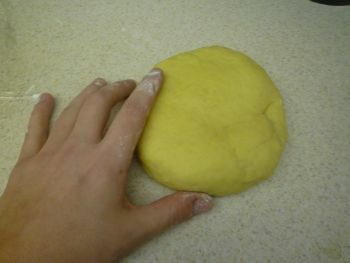 Press the dough evenly into the bottom, going about 3/4-inch (2-cm) up the sides of the pan. Freeze the dough-lined pan until firm, about 30 minutes. Preheat the oven to 375°F. 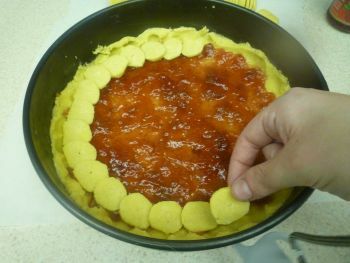 Spread the jam or marmalade evenly over the dough in the pan. Cut the chilled dough log into very thin discs with a sharp paring knife. 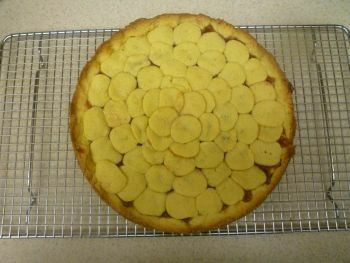 Arrange them in overlapping concentric circles over the jam to form a top crust. Whisk the remaining egg white with a teaspoon of water until frothy; brush evenly over the tart lid and then sprinkle with the coarse sugar. Bake until the top crust is golden brown, about 25 minutes. Let cool completely before unmolding. This holds up well and can be made up to 3 days in advance. Keep wrapped in plastic at room temperature. Generously butter a 9×13 in. pan. In a large saucepan over medium heat, combine the sugar, corn syrup, butter, sweetened condensed milk, water, and vanilla bean paste. Stirring often, cook this mixture until it reaches 245 degrees F.
Remove the pan from the heat and stir in the salt and chopped nuts. 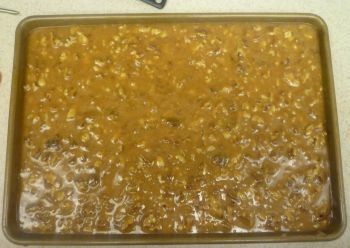 Pour the caramel into the buttered pan and cool completely (about 2 hours). Turn the slab of caramel out onto a cutting board and use a pizza wheel to cut into squares. I usually get 128 pieces of candy from this recipe. Wrap the candies in pieces of wax paper and store in a cool, dark place. Hope you enjoyed checking out the menu. Thank you to everyone who joined us and made the party so much fun. I love new recipes, and I really enjoy reading your blog very much thank you for sharing this post. Feel free to check out our recipes.